Open up a new perspective on reality by studying Tibetan Buddhist philosophy! This diploma course is designed for all those who want to study the essence of Buddhist wisdom in a profound way in order to gain an insight into the world of thought of great Buddhist masters such as H. H. Dalai Lama. This insight can be the entrance door to more cheerfulness and inner strength. 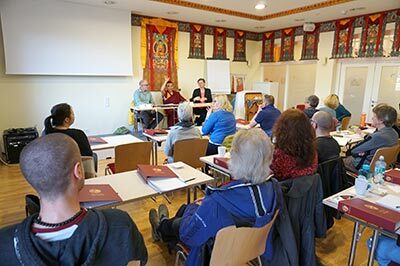 The diploma course is as comprehensive as it is compact and covers all aspects: from the basics of Buddhist thinking to depictions of emptiness in the various Buddhist schools. you are a practicing Buddhist – no matter what tradition – and you want to put your practice on a solid foundation. Anyone is welcome to join! There are no prerequisites. Your teacher will be the Ven. Geshe Tenzin Dhargye, who has taught the course, alongside other experienced and qualified teachers, since 2010. 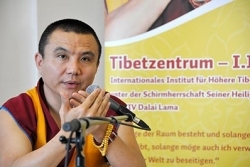 Language of instruction is Tibetan/English with German translation, and German. Students are now welcome to enroll half-time, with a focus on philosophy (PHIL) or religion (RELI); however, the exam + certificate is only available for full-time students. and ends on 8th – 9th May 2020 with the last module. Successfully completing the course requires completing homeworks for all 7 modules (which entitles you to a document of participation). You may now enroll half-time if you wish, with a focus on philosophy (PHIL) or religion (RELI). While the final exam is optional (for full-time students), students who pass will also receive an official certificate, jointly issued by Tibet Center Austria and CUTS.